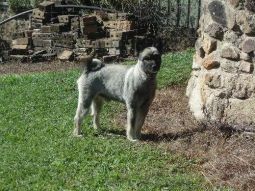 Keeshond breeders links and breed information on pups4sale.com.au. pups4sale testimonial: I have used your website for many years now and wish to say "Thank You" for all your help that you have provided and the success that I have achieved selling my puppies. Thank you, thank you! The Keeshond may look like it is a medium-sized dog because of its fluffy hair, but it is, in fact, considered a small breed. 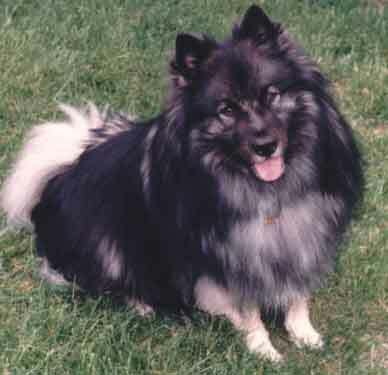 Besides the hair, the Keeshond is known for its dark eyes and upright, triangular ears. Male Keeshonds can grow to be close to 20 inches tall, while females will normally be two or three inches shorter. Both sexes will generally max out at around 45 pounds, though they can get a little bit heavier than that. Keeshonds, like the arctic dogs that they come from, have a double coat to help them deal with harsh winter weather. The undercoat is very thick, while the outer coat is long and soft to the touch. 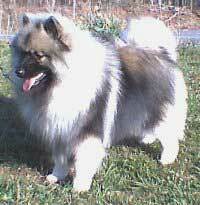 Keeshonds have a popular tri-color coat, which is made up of varying mixtures of black, gray and cream. The amount of these three different colors in their hair generally stays the same from when they are puppies all the way through adulthood. Keeshonds are known throughout the world as being great family dogs because they are very affectionate, intelligent and active. They will play with people of all ages for as long as they are allowed to and love to cuddle up with their owners when it is time to settle down. Every once in a while, Keeshond puppies will be naturally shy, but they can grow out of this behavior if they socialize with people and other animals at a young age. This is important no matter what personality a Keeshond puppy has, but the ones who are less outgoing need a bit more time to become less timid. Keeshonds absolutely love children and will often want to play with them more than they will with adults. They can play for hours, but won't be overly aggressive when playing with the young ones. Keeshonds do get a bit attached to their owners, but, unlike with other breeds, this doesn't keep them from getting along with other dogs. They do need to be socialized with other dogs at an early age, but it doesn't take as much time for them to get along with other animals. Keeshonds are fantastic watch dogs because they will bark like crazy whenever they sense a stranger around the house. They don't really work as guard dogs, though, because they are not the type of animal that will instinctively bite or attack. Like most other breeds, the Keeshond does not like being left alone for long periods of time. They are prone to chewing and barking when they are separated from their owners for too long, so it's important that someone is around them for the majority of the day. The Keeshond is one of the top 20 most intelligent breeds in the world, but this does not mean that it is easy to train them. Owners need to know how to train this specific breed in order to move training along smoothly. Keeshonds do best when they are trained by someone who is always calm during sessions and is never overly aggressive with their pets. They want to please their owners, so even though it may take multiple tries for them to understand a command, other commands will come quicker because they see that it makes their owners happy. One of the main reasons why Keeshonds have to be trained early and often is because of their high intelligence. Naturally smart dogs will find things that keep them interested, which means untrained Keeshonds often will dig or chew when they aren't receiving the attention that they crave. Keeshonds love their exercise and are happy to release it any way that they can. They are an active breed that will spin around for attention or play fetch for hours. They like to run more than they like to walk, which is why it's important that owners teach them early when they need to calm down and walk when they're outside. Keeshonds have no problem releasing pent up energy inside of the house, which is why they need to get their daily exercise outside. They don't need extended time outdoors, but around an hour a day of walking and running will keep them from becoming overly hyper indoors. While it is okay to take a Keeshond outside in hot weather, they should be well hydrated to keep them from getting uncomfortable. Their thick coats can get them overheated pretty quickly, so running should be limited on these days to keep them from getting sick. More advice on the exercise needs of Keeshonds can be found from a Keeshond breed association. People may look at Keeshonds and think that they would need a lot of grooming because of their big, thick coat, but that isn't necessarily the case. They do need be brushed either daily or every other day, but the rest of this breed's grooming needs are pretty simple. Like with other thick-coated dogs, owners need to be careful to get all dead hair off of the dog before they are cleaned in soap and water. Not doing so can irritate the skin and can lead to hair matting. Owners don't need to clean their Keeshond's ears too often, but they should be at least checked once a day to make sure that they are clean of insects and dirt. Keeshonds have paws the shape of a cat's, which means that their nails have to be kept trimmed to keep them from growing into one another. This also ensures that their weight is being put on the pads of their feet rather than their nails. It's important that owners give their Keeshonds a strict diet because they will eat everything that is in front of them and will gain weight very quickly. This weight gain can lead to heart and other medical issues, but it can easily be avoided if owners know what and when to feed their pets. Keeshonds generally have long lifespans for dogs, with most living 12 to 15 years. The most common diseases associated with this breed are hip dysplasia and multiple skin issues, but they are relatively healthy dogs. One of the reasons why Keeshonds are so popular is because they are comfortable in just about any clean environment. They can live just as happily in an apartment as they can in a big home. Owners should at least have a decent sized yard or grassy area for their Keeshonds to stretch their legs in, though. It's also important that potential owners have the time to spend with a Keeshond, which means that they should not be left along for more than a few hours during the day. As long as someone is around to spend time with them, they should be happy enough and won't chew things around the house or annoy the neighbors with their barking. The Keeshond has specific grooming and exercise needs, so owners that can't meet those needs should avoid the temptation to get this breed. This is the type of dog that has no problem letting people know that it is uncomfortable or unhappy, so owners who can't meet the breed's needs will end up having a frustrated dog and will be frustrated themselves. It's not absolutely necessary that owners live in a cooler climate, but it is vital that Keeshonds are kept cool the majority of the time. If they do live in a warmer area, their homes should be kept cool to keep them from getting uncomfortable in their own fur. It's okay if Keeshond owners don't have experience training dogs, but someone who doesn't have the time to work with this type of breed is not going to be a good match. They respond well to owners who care about them and want to go through the steps of training, but they will become unhappy if owners are overly aggressive or show too much frustration towards them. The Keeshond might not be the most popular breed in the world, but those who have met a Keeshond know that it is one of the best mixes of intelligence and teddy bear. They will work hard to please their owners during the day, and they will happily cuddle up with their owners when it's time to wind down. 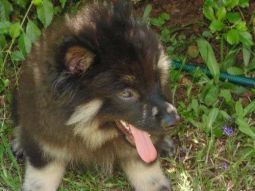 There is a lot to like about Keeshond puppies, but potential owners should know about all of their specific needs before they commit to this breed.